Our XP series UV powders offer exceptional performance. These are organic, world-class powders that are the brightest powders we have ever tested. 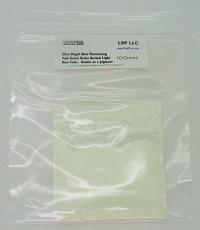 Under normal light, these powders range from a pale beige to a pale green. 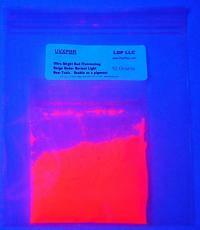 Under 365nm ultraviolet light (Blacklight), the powders emit an extremely strong response. The powders can be used for Process Control, Tagging, Systems Monitoring, Leak Detection, Theft Detection and many other uses. 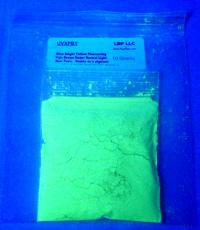 The powders are so responsive that very tiny trace amounts that are completely invisible under normal light will shine quite brightly under UV light. The UVXPBR makes a very good antitheft powder too. 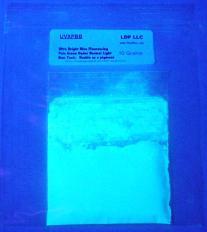 Because the powder is so highly fluorescent, trace invisible amounts can be seen under UV / black light. Since the powder has a normally light beige appearance in quantity, clean-up is less problematic than our visual staining anti-theft powder ATPR. The UVXPBB and UVXPBR are also part of our class of Invisible Powders. Additional information on the invisible powders can be found here. Greatest fluorescent visibility. The amount of UVXPBR that you can fit on the sharp end of a pin will be clearly visible under UV light. Very tiny amounts can be easily seen. Greatest shift from the UV light. UV lights have a bluish glow. The UVXPBR shows up a very bright red on the other side of the spectrum. This shift between stimulation frequency and emission frequency is the greatest with the UVXPBR. This means that it is easier to see the UVXPBR. It is highly unlikely something else will be fluorescing at the UVXPBR frequency. Greatest solubility. 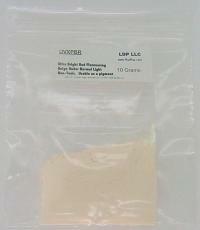 The UVXPBR is completely soluble in acetone and toluene. 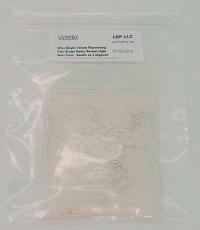 Many other powders have lower solubility. Hardest color to duplicate. Because of the unusual properties of the UVXPBR and greatest cost, the possibility that someone else will find a substance with the same color characteristics is much lower.